I am slowly working on scanning all my boosters and it occasionally throws up something that I haven't noticed before. I am doing Legions at the moment because that box was on top of the pile. I noticed that Traditional Chinese boosters have a Zig-Zag cut across the top and bottom of the boosters but none of the others do. And apparently they are made in Belgium the same as most of the other boosters which have a normal cut. I will go through the rest of my boosters slowly and I am sure I will find out that there are many others and it is quite common, I just forget about them. I am guessing the edges make it easier to open the booster but I am not sure why they don't all have them. This is interesting. It reminds me of an Italian crimped card I saw. I think I remember talking about this boosters and the chance of them being fake not long ago. Anybody remembers? I have mines set appart just in case. CHaPuZaS wrote: I think I remember talking about this boosters and the chance of them being fake not long ago. Anybody remembers? I have mines set appart just in case. Still giggling at this, while a bunch of those square cornered cards were found in officials boosters and from different editions or extensions all over the years. 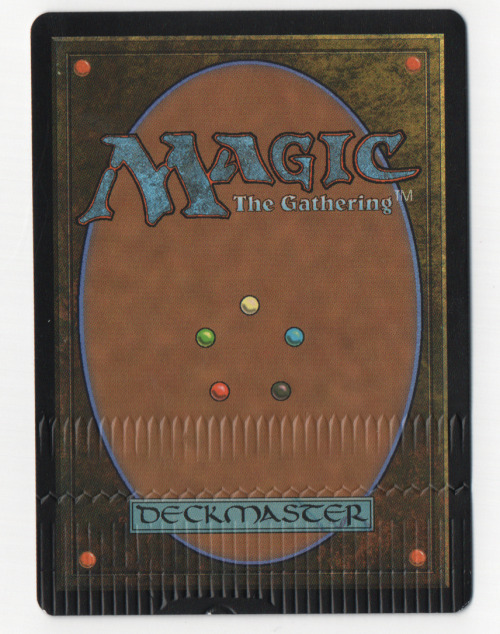 Why it's so hard for WotC to admit a bad quality control that can happened sometimes instead of claiming that they were never released in official products even back then when that article was written. I can't remember if we got them from the same place or not. 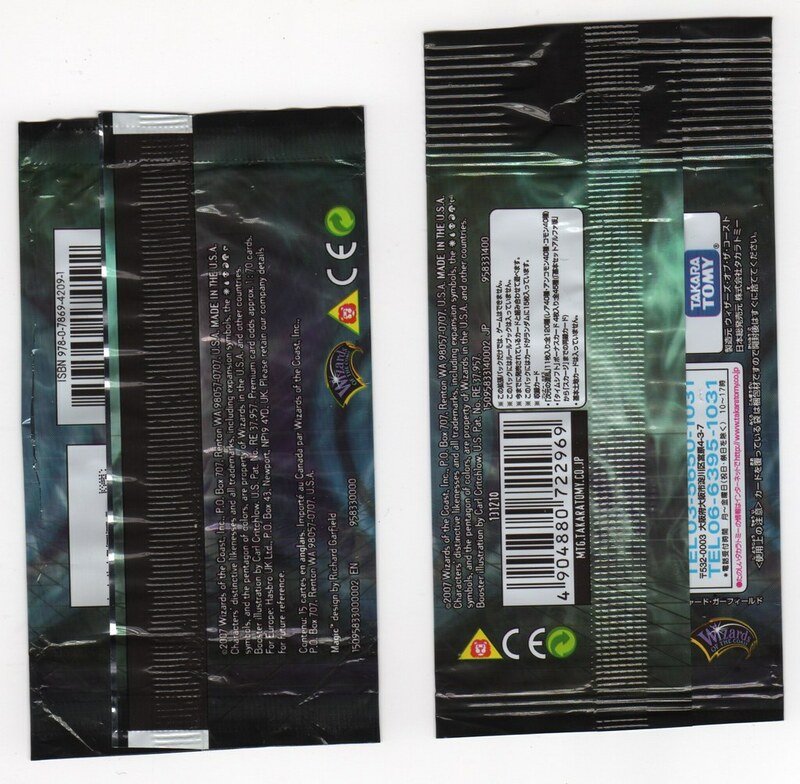 The rest of the sealing is normal and not the usual way that fakes are done. I will have to keep an eye out and see if I can find any more. Something else to add to the To-Do list. I also have some of these that I pulled from a shrink-wrapped box myself. Excellent! So not fake then! I wonder if they come in the normal type of booster and I also wonder how this came about. I guess this is part of what makes collecting MtG so interesting. Cheers for the input everyone! Here's my crimp with the zig zag on it. Not from the same language or set, but it is a cutting pattern that is used. That is interesting, I will keep going through my boosters and see how often it is used. I am slowing double checking my have/want list and noticed something I haven't noticed before. It reminded me of this thread, so I share it here. (Apologies if this is old news to the more senior collectors on this forum.) 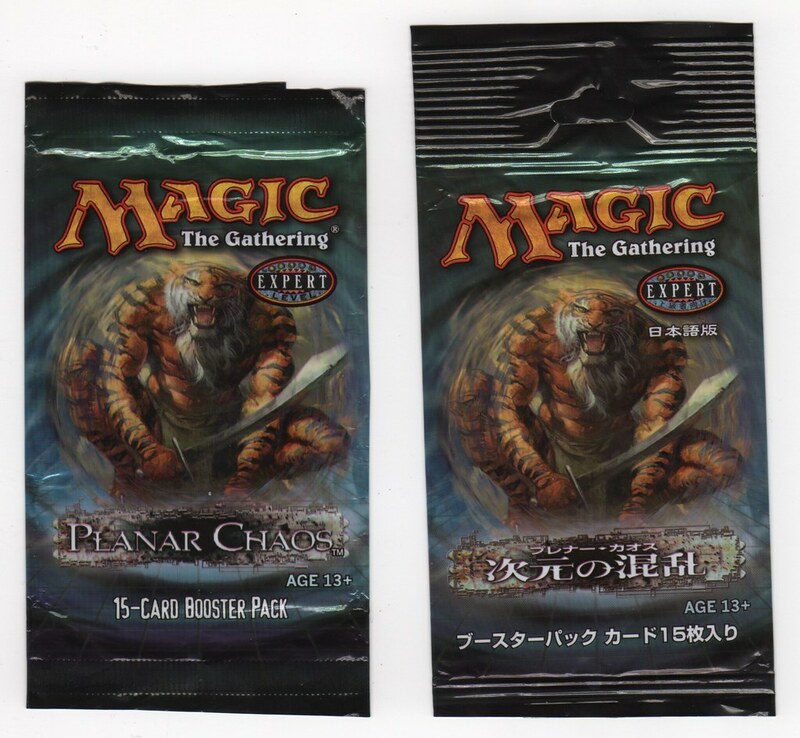 The Japanese version of the booster pack (see below for pics) has not only an elongated top part but also a different crimp seal: the crimp is spaced out and "sideways" in comparison to the usual crimp. I do not recall having seeing a similar crimp elsewhere, which may very well be due to my limited attention to these things. Which makes storage a pain as the Japanese Boosters are taller! I am not sure when the changeover occurred as they used to be the same. With maybe a trial run of the new packaging in Apocalypse?